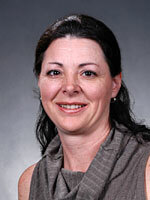 Leigh Ann Kamerman Burns, MS, LDN, RD, has practiced medical nutritional therapy for 20 years. A specialist in the area of nutrition support, she earned a BS from Northeastern Louisiana University and an MS from Louisiana Technical University. She spent fifteen years practicing as a Nutritionist for the E. A. Conway LSU Health Sciences Center in Monroe and serving as an Instructor for there LSU School of Medicine in Shreveport, where she cared for the critically ill, including oncology patients. She has dedicated much effort to cancer prevention and early detection. Her work in this area includes coordinating the Partners In Wellness Cancer Screening (screening) program for ten years. In 2002, she transferred to New Orleans, where she is an Instructor and Clinical Specialist in the Department of Nutrition. As a member of the Cancer Center, she has joined the statewide disease management team for cancer prevention and early detection. She teaches medical students, residents, and fellows various areas of nutrition and participates in both research and patient care in the area of oncology and cancer prevention. She has specialized in the clinical practice care of oncology patients for fifteen years, spending much of the last four years caring for patients with carcinoid cancer.